"How can citizens view the birthday of the country they live in as illegitimate?" I don't see anything wrong with a State that proclaims it is Jewish not giving legitimization to the denial of it being so. Imagine US Jews declaring a day of morning on July 4 - that would be unacceptable. How can citizens view the birthday of the country they live in as illegitimate? People forget where we are living.... The moment the Arab public in the country says the establishment of a Jewish State is a catastrophe, it contradicts not only the Zionist outlook, but also the principles of international law. Just as I don't have the right to defame people in the street, they do not have the right to defame the State. I guess Frederick Douglass must have forgotten where he was living. I don't know when things will let up, I really don't. 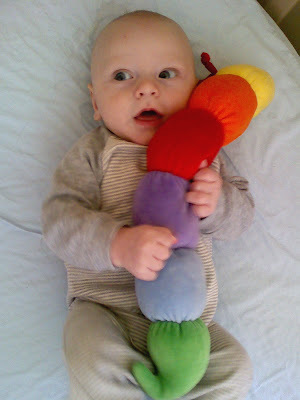 I'd like to think that I'll get back to my blogging frequency from, oh, 2007 - 2008 -- and the quality (I like to think that) I hit (if only sporadically) in those years -- but I don't know when I will. If I do, this will be the space. 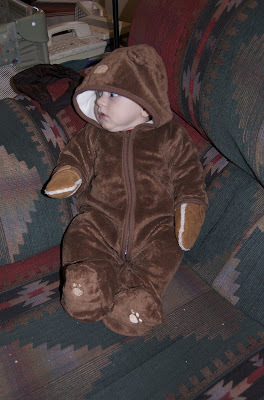 In the meantime, here's Joseph in a bear suit. There is a fine line between fiction and nonfiction, and I believe Jimmy Buffett and I snorted it in 1976. Two separate incidents today, combined, tell you pretty much all you need to know about our political system at the moment. 1. The FTC has gotten over 30,000 complaints about those annoying robo-warranty-phone calls (I've gotten two on my cell & 7 on my work number, plus a bunch at home, all in the last few months). These calls violate the "do-not-call" registry; they're also a scam. After 30,000 complaints, the FTC does nothing. Then a senator gets one of the calls, complains -- and the robocalls are shut down at once. 2. Bush, having captured a bunch of people that he couldn't prove guilty in court (unsurprisingly, since at least some of them (that we know of) were innocent; plus his torture program made a lot of evidence inadmissible), set up a system of Military Commissions to try the people (since he just "knew" they were guilty) without all those annoying procedural safeguards that our normal court system has. Obama, having run on a campaign of change, has now instituted... Military Commissions with fewer annoying procedural safeguards than our normal court system has, albeit more than Bush wanted. 1) 30,000 citizens count for nothing; a senator must complain before a law is enforced (but his complaint is jumped at instantly). 2) One party believes in junking all the procedural safeguards from the court system to try detainees; the other party only believes in junking some of them. Greatest country in the world, baby; greatest country in the world. Hooray for the great state of Maine! A few years ago, this would have been front page news. Now it feels like history repeating. And justice slowly seeping up like a rising water table that becomes a mighty and joyous flood. And, dear New York legislature: if we're not in the top ten, it's gonna be downright embarrassing. So get on it please? Soon?